It should be much brighter, of course. 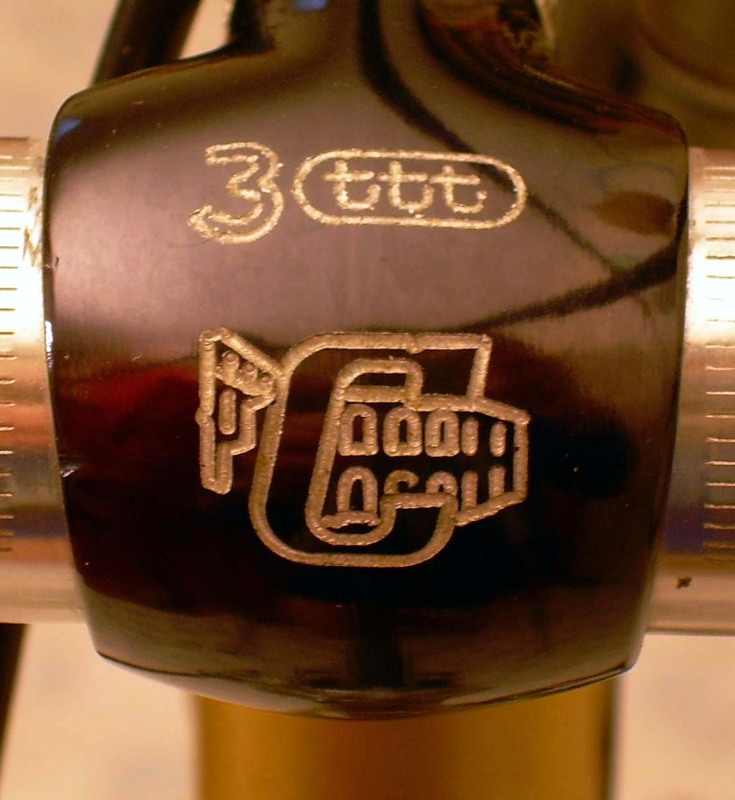 The bike still has no handlebar tape – sigh. 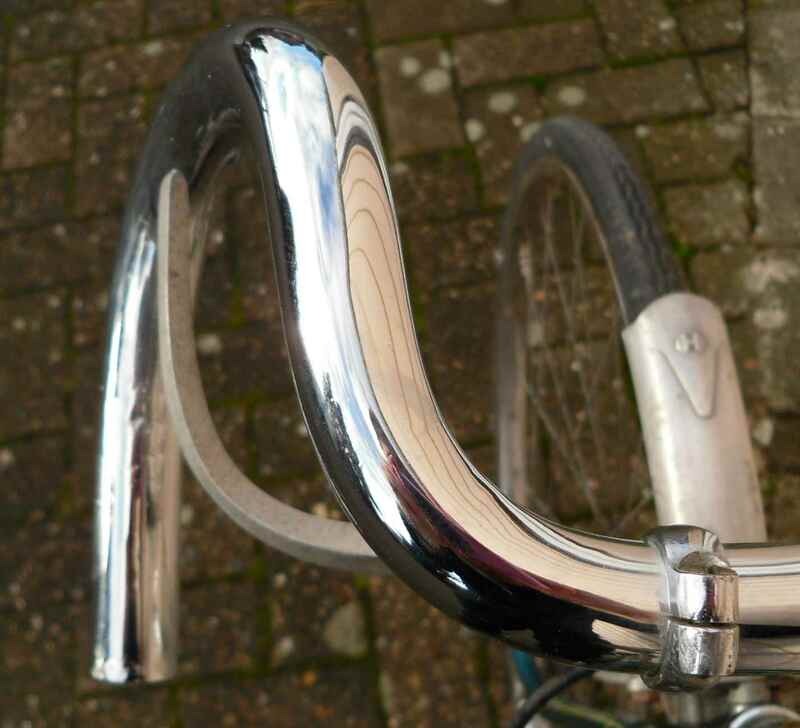 The bend of the ATAX bars, which are brazed into the extension, looks great, though. 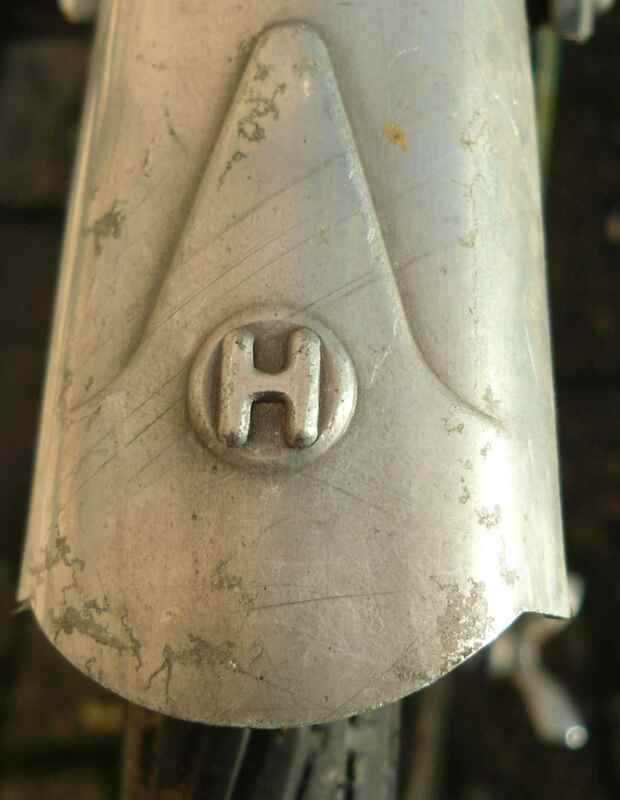 The alloy mudguards, much younger than the frame, sport an “H” each at the easily accessible ends, but my guess is that this really stands for Hercules. They look nice anyway. Sometimes I just can´t resist a bad joke. 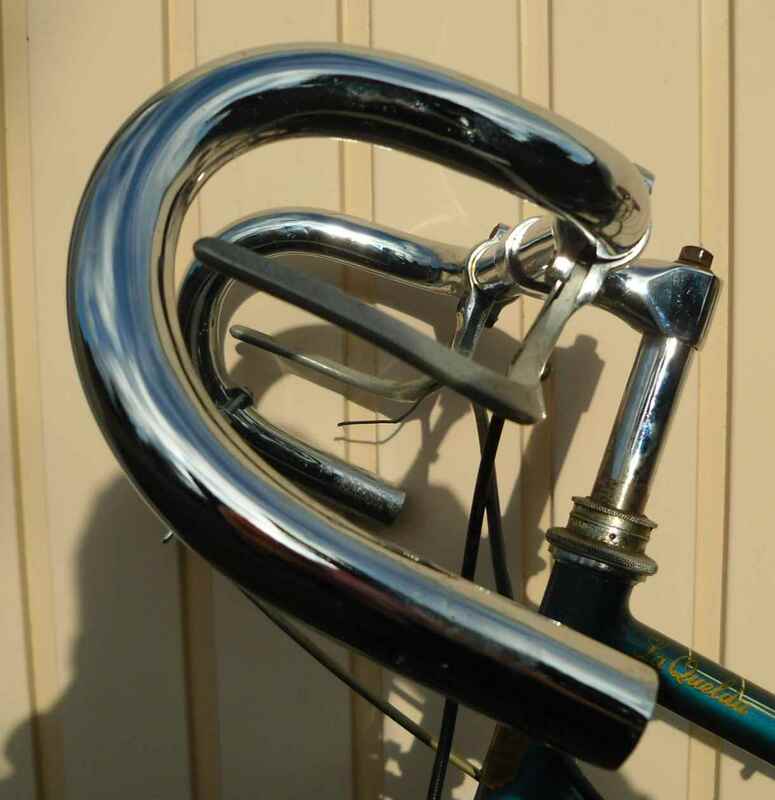 In the same vein: I know that the GB brakes only appeared in 1948, and the handlebars inclusive of French brake levers came off a wrecked thirties Ravat tandem, but there you go. 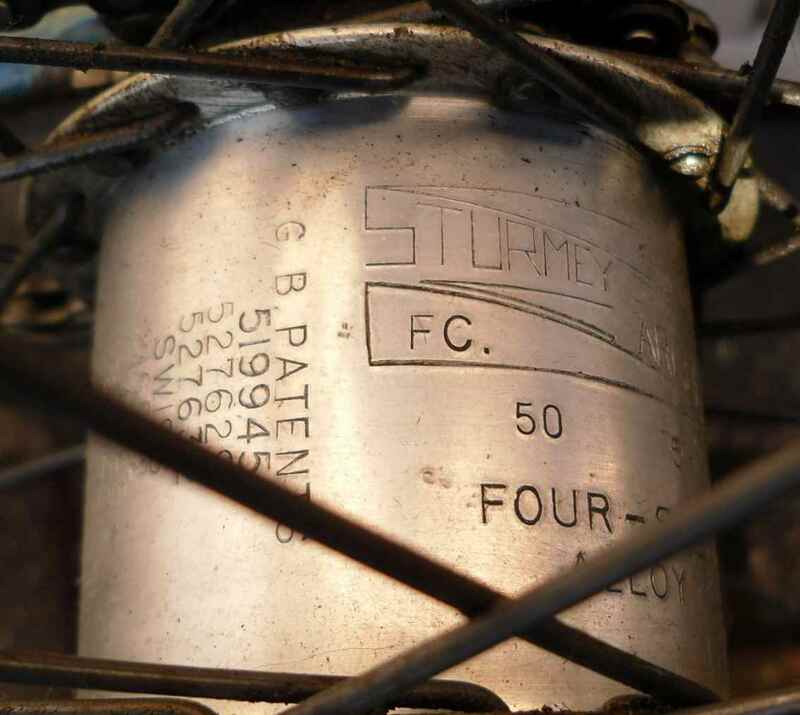 The Sturmey FC wheelset has a special story, too. A year or two after getting the frame in 1997, my family and I visited our old haunt in the UK, Greater Manchester. Cyril Bardsley still had his shop then, and in I went and asked for a pair of wheels, steel Dunlops rims, FC hub, 26 x 1 1/4, if possible with the correct trigger. 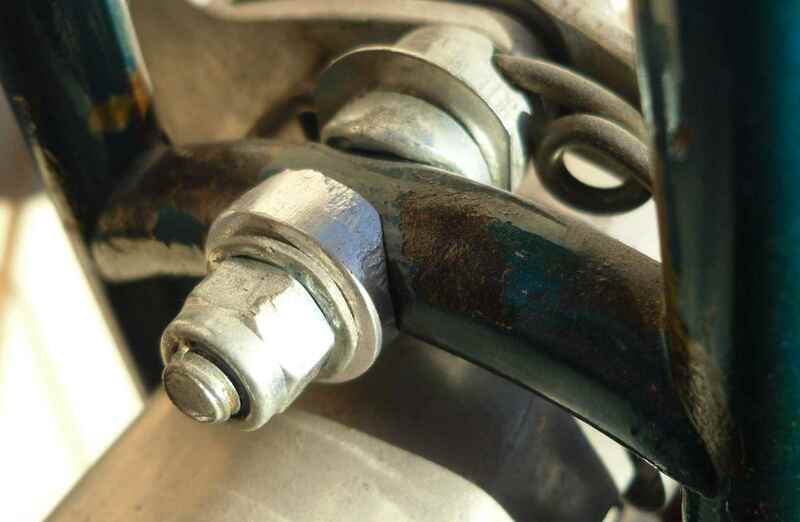 I must have been quite naive then, or must have had a good opinion of British bike shops, or maybe you could call it somewhat belated beginners luck, but I can remember Mr Bardsley not batting an eyelid, vanishing in the workshop, and returning just with what I had asked for. 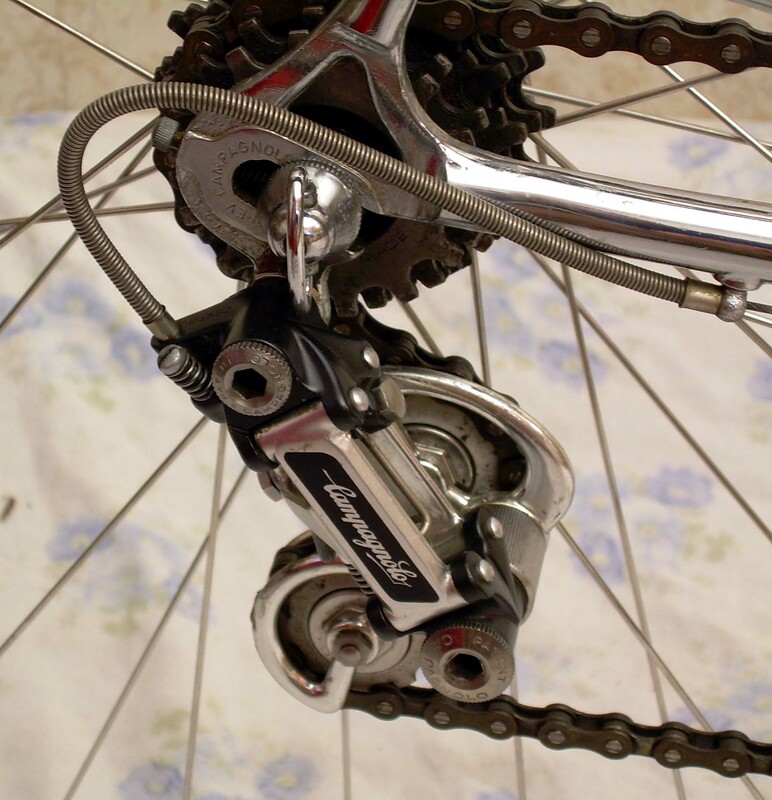 Sorry to say I can´t remember the price, I think it was 60 quid, but the wheelset came with a spare toggle chain of the quick release snap-in-two variety. I also remember the shop walls being decorated ceiling high with race photos and what looked like autograph cards to me. I guess one of them must have been by Reg Harris. Back to the frame, though. Note how the transfer covers part of the lining. No idea what this means. Like all LaQueldas, this one is of lugless construction. 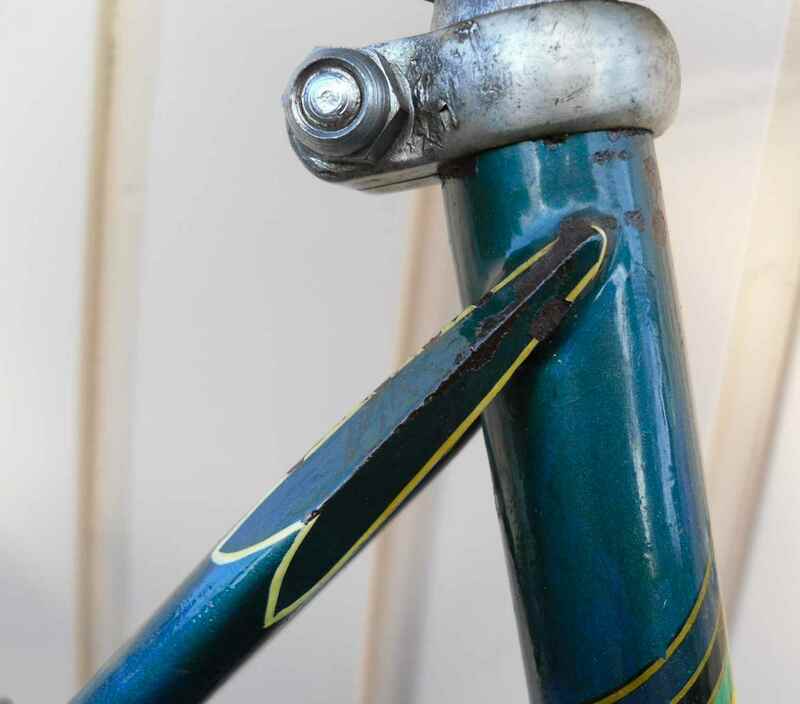 The long pointy seat stay top is typical of many bikes of this era. And don´t I just love the double box lining everywhere. 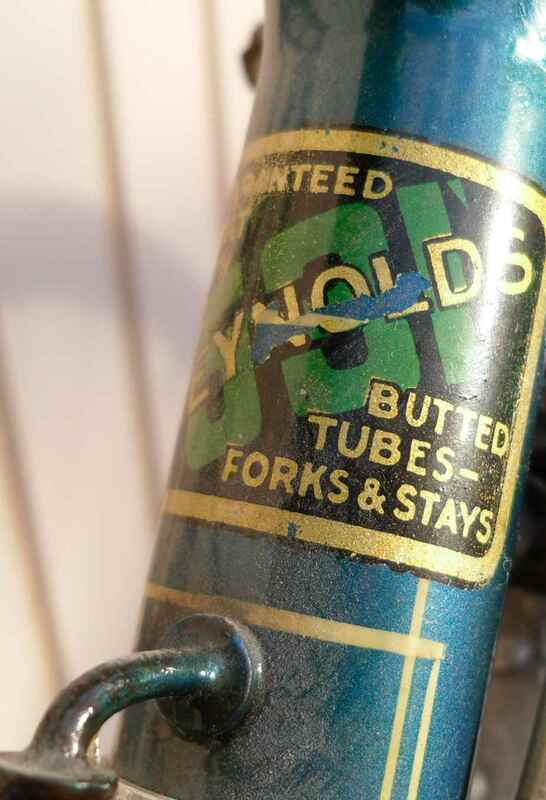 The fork is of a standard construction, save that the blades are round. Is this art, or can I chuck it? There´s been a running gag in Germany during the last few months, “Ist das Kunst oder kann das weg?”, alluding to the recurring problem that cleaners in museums and galleries have been destroying works of art because they hadn´t recognised them as such. What do you think of this? Is this horrible 1980s kitsch, or beautiful? 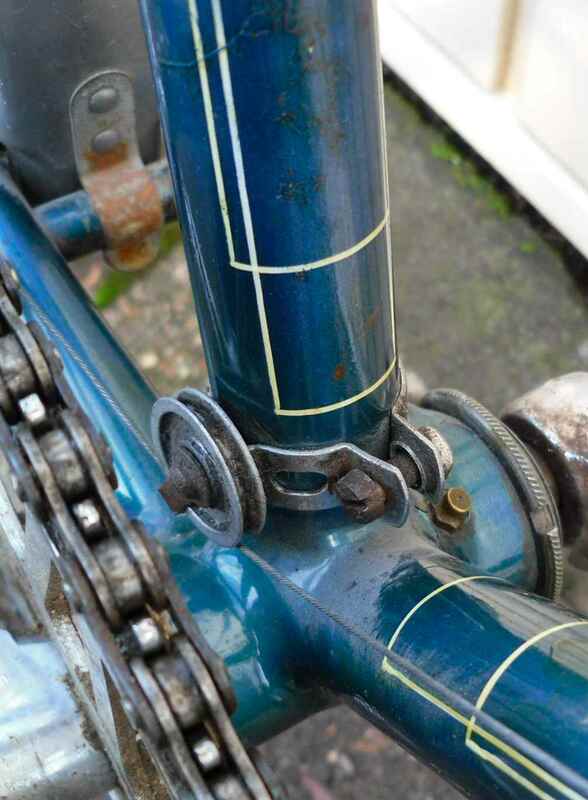 To begin with, underneath the debatable paintwork, fashioned by the first owner after the John Player Formula 1 design of the early eighties, there is a very able bike, luckily only raced for two and a half seasons. Let´s have some looks at bits before the unavoidable story which comes with it. 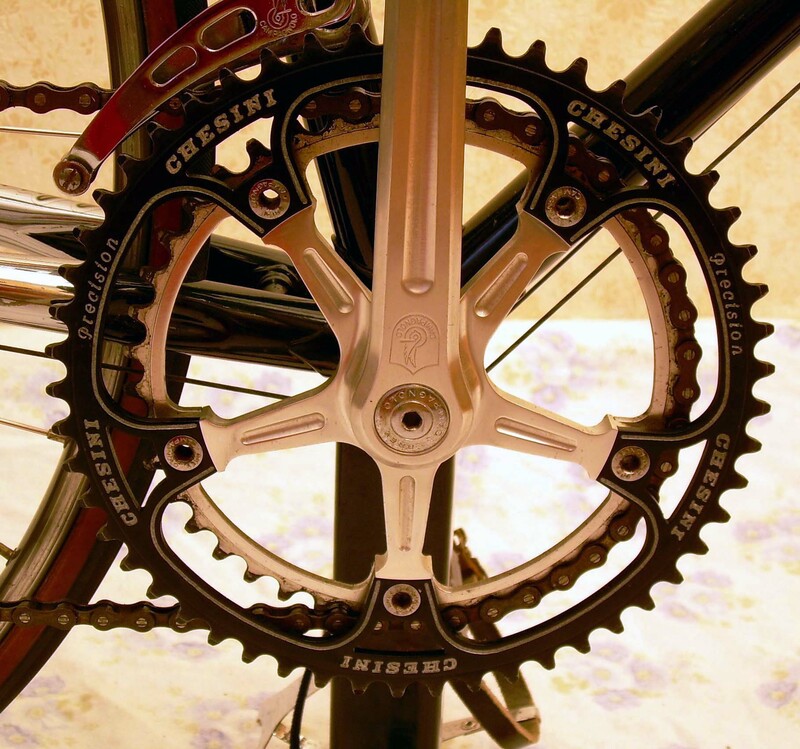 The heart of the groupset, an SR crankset with black anodized and engraved big chainwheel. 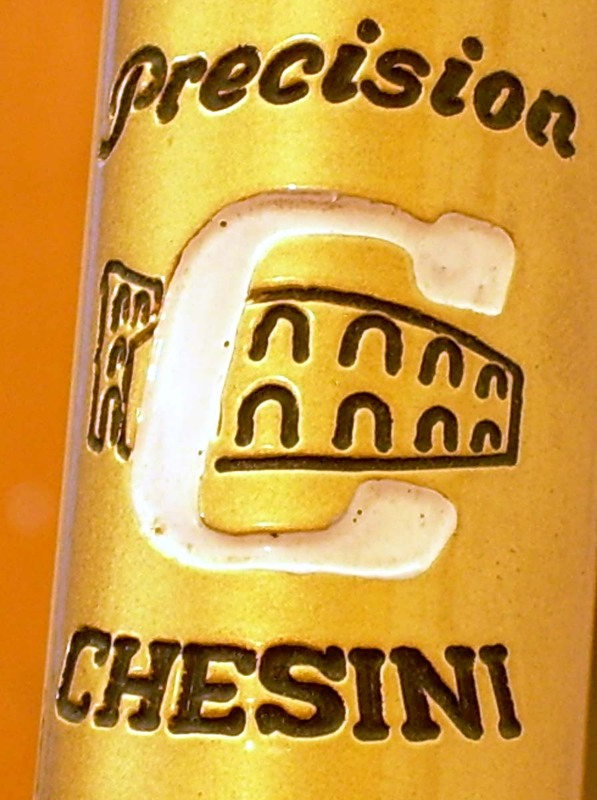 All Chesinis come with these, don´t they? … one of which is repeated on the rim. … just like the other end. 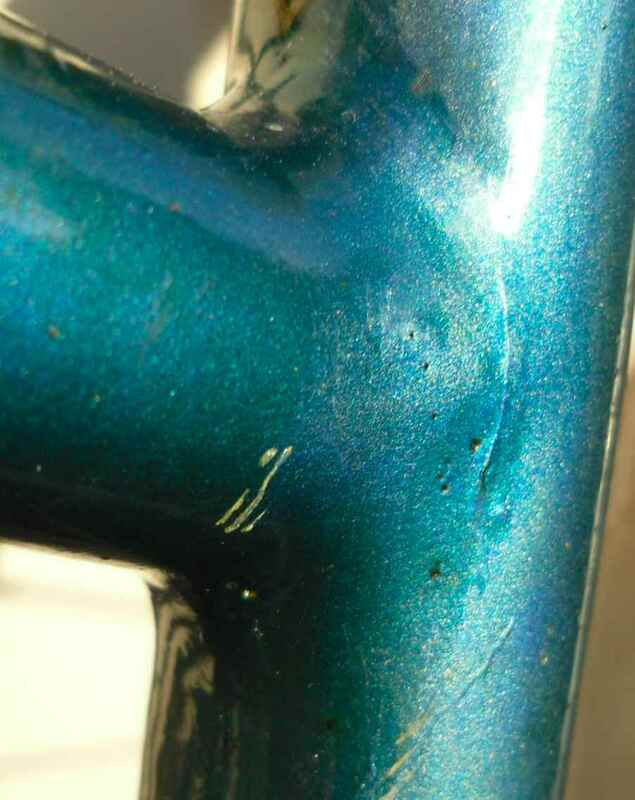 It´s a shame the clear coat over the chrome is throwing in the towel; no idea how to fix this one. And here´s some more anodizing and engraving. Do I hear you say “sad about the nice SR seapin, though”? 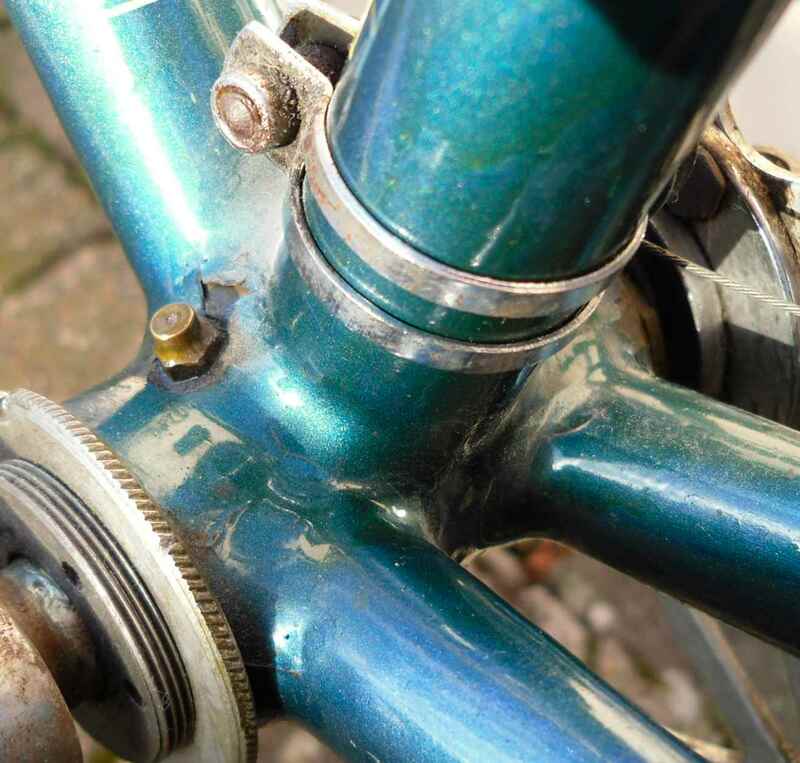 I took the liberty of changing the original NR rear mech out for this beauty which I found in Maarsen a year after getting the bike. 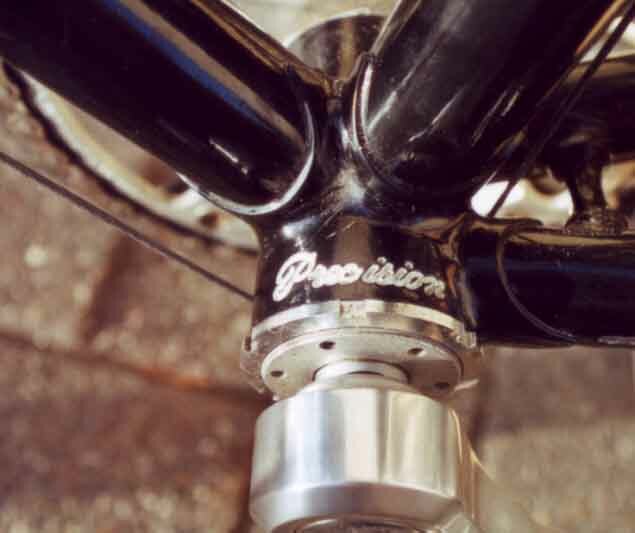 The first owner, who I got the bike off of, had built the bike when an art student a back in ´81 and only gotten the Chesini marked SR parts, the rest were NR (see headset). 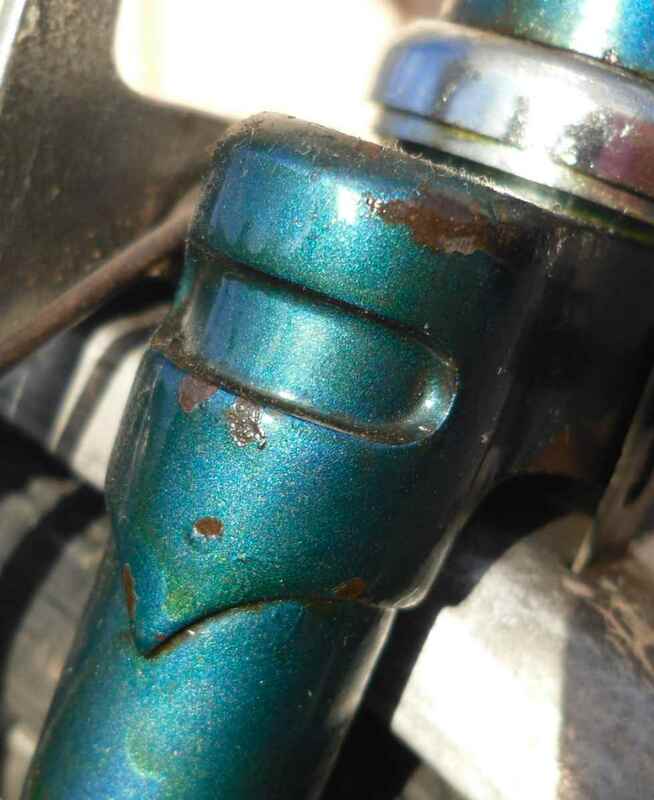 Yet another proof that the bike has seen very little action. 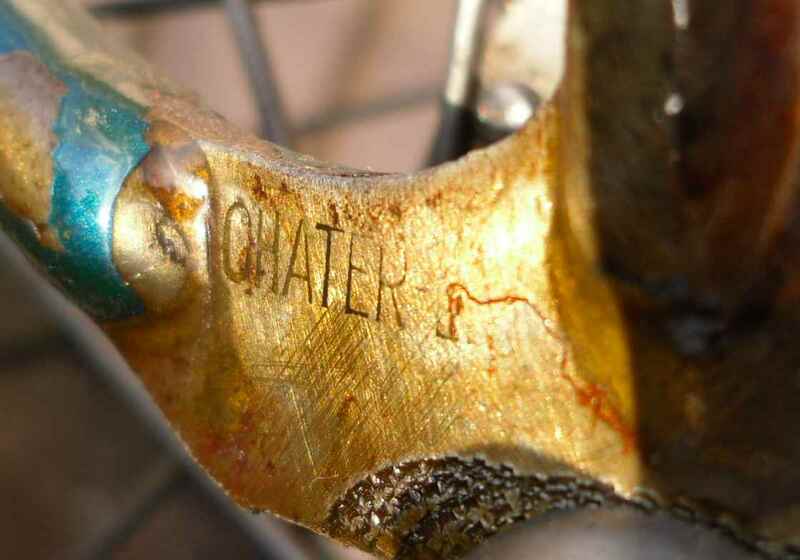 Engraving even on the bottom bracket. 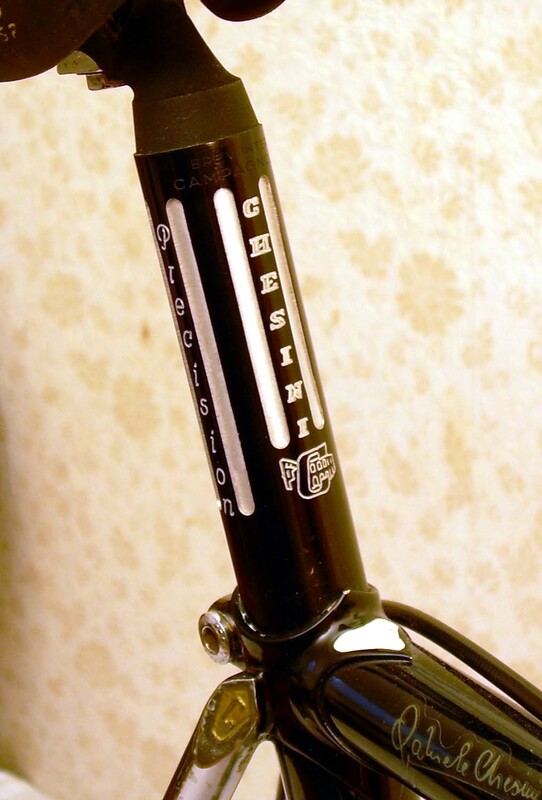 And lastly, the typical Chesini headtube treatment. About a month before the first Dutch collectors´ meet was staged at Rotterdam, a Dutchman from Amsterdam posted his first and last message (last post always sound a bit morose) on the CR mailing list. First, because it was his first, and last, because Dale promptly booted him for not signing off correctly, and not giving the price of the bike he was selling. Thing was, I had seen the post and rung the chap straight away. The price he asked was very fair, and as Amsterdam is more or less on the way to Rotterdam from here, I transferred a down payment and wanted to pick up the bike en route to the meet. The seller lived right in the middle of Amsterdam, next to one of the famous “grachten” canals which crisscross the city, so, helped by my then 10 year old son, a very able map reader even then, I threaded my way though the narrow passages that go for roads in Amsterdam. We were, BTW, in our 1976 Citroen AK400, a sort of 2CV van. We actually found a place for plonking down the van right opposite the house where the bike was. In doing so I nearly drove the van in the canal, which gave me a start I still remember. 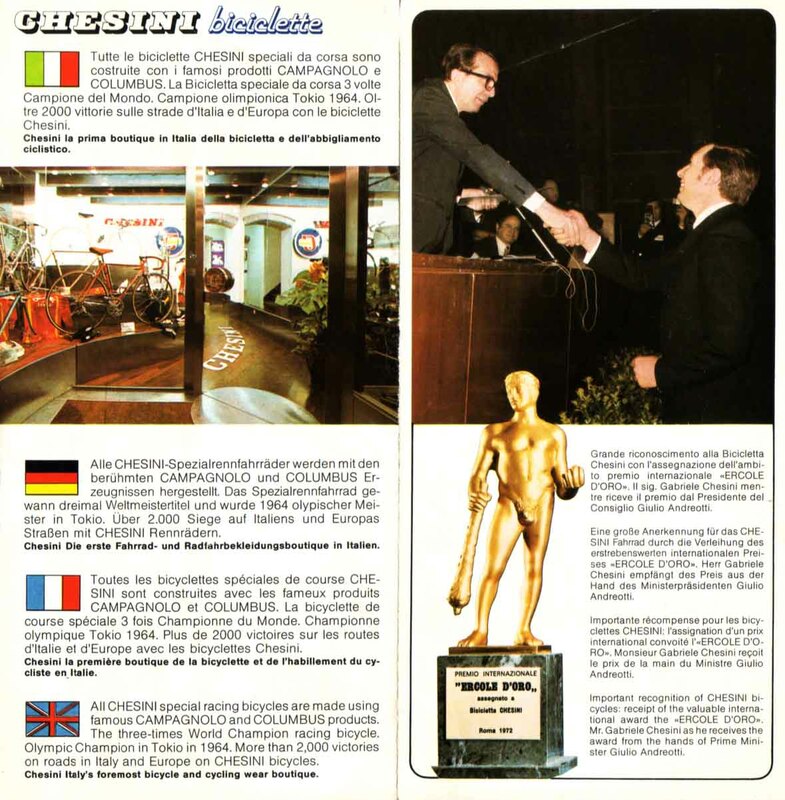 Anyway, the deal was struck, and off we went to Rotterdam, where the Chesini attracted some attention only hours after having changed hands. The seller gave me the original sales leaflet (scans below) and promised to look for the bill of sale which he also thought he had kept but could not then lay his hands on. The Rotterdam meet was remarkable for number of reasons; it was perfectly organized by Freek Faro and his clubmates, we met a number of people we had only exchanged emails with before, and much as I like visiting its Neerkant “Stalen Ros” (steel horse) successor, I remember the Rotterdam meet fondly. 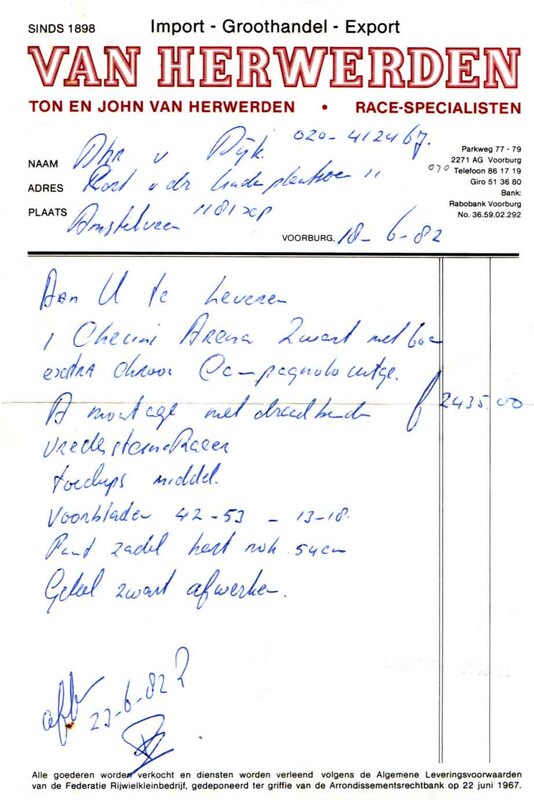 More than five years after selling the bike, the seller remembered that he had promised me to send the bill of sale when looking inside a carrier bag he hadn´t used for years. 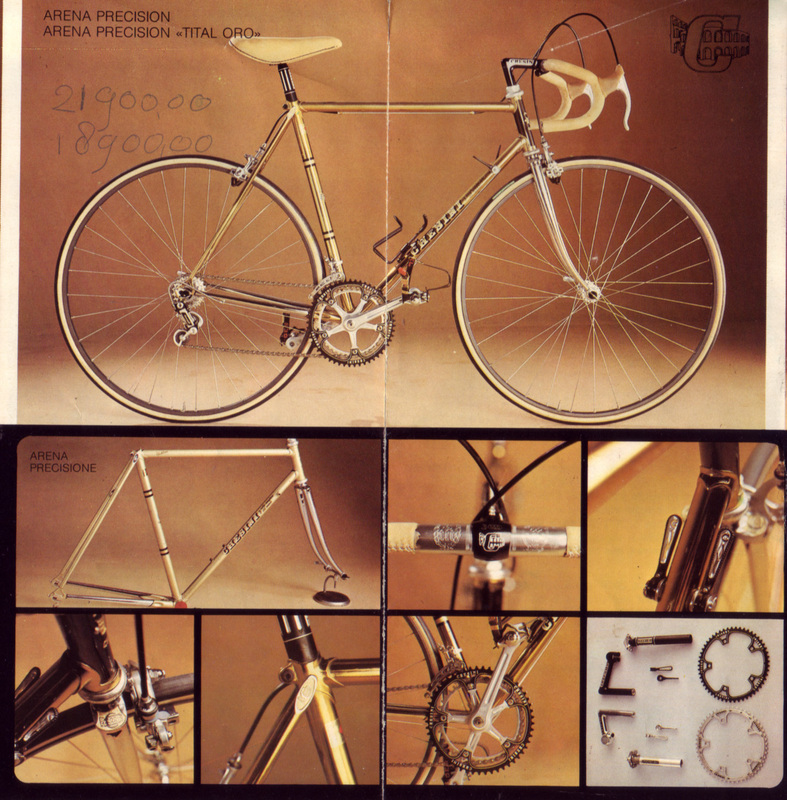 The envelope was in it, together with some more sales leaflets of Nishiki and Koga Miyata provenance. 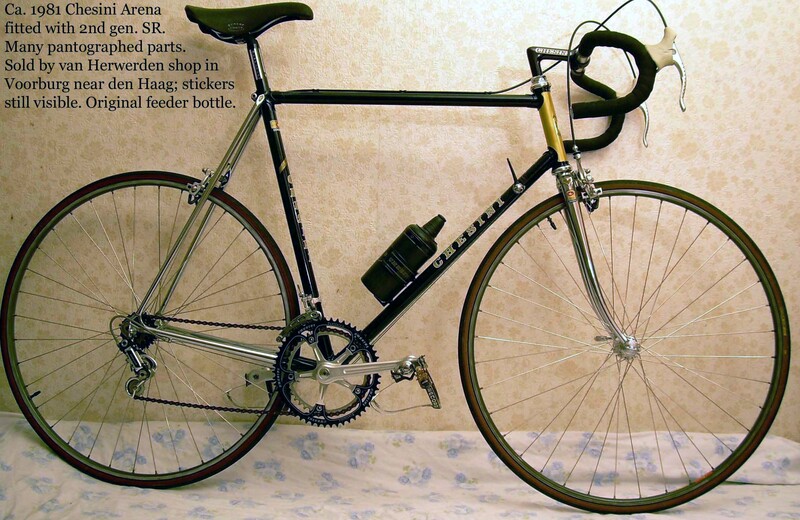 It said on the bill of sale that the bike was to be built up with Campag and was to have wire on rims/tires, which for an out-and-out racing bike was something special then. 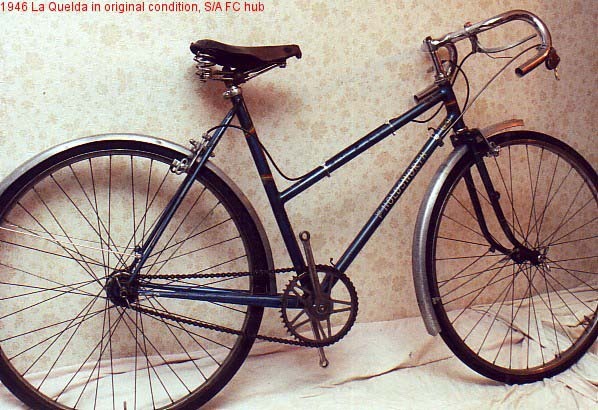 The order was taken on June 10, 1982, and the bike was delivered 13 days later. 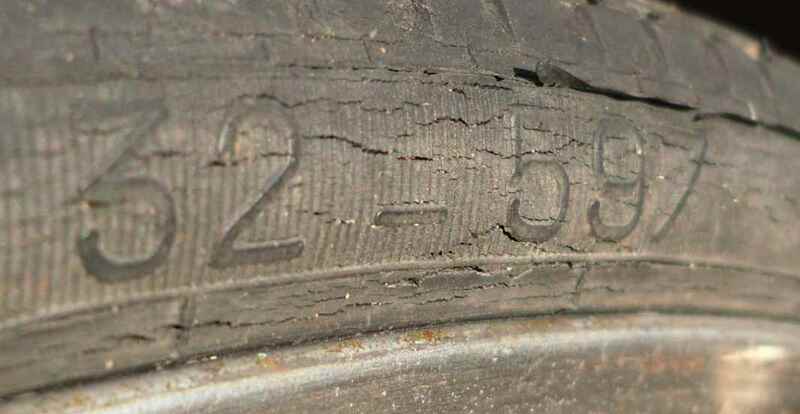 There is a practically invisible cash register imprint which states that the actual price was 2558 Guilders, quite some money then, and 123 Guilders more than planned, it seems. 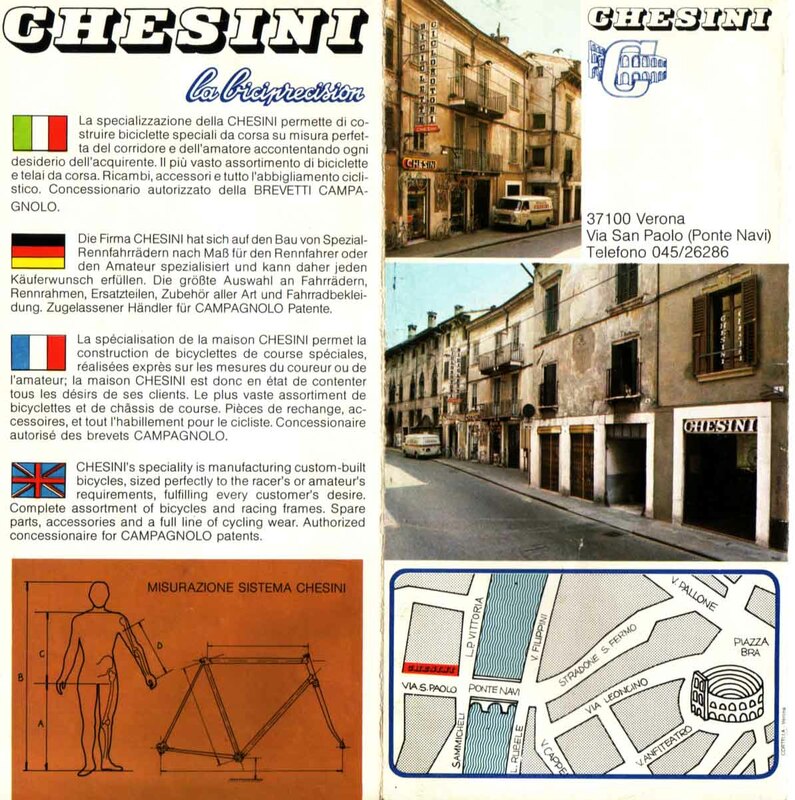 Here are some impressions from the early eighties Chesini brochure. 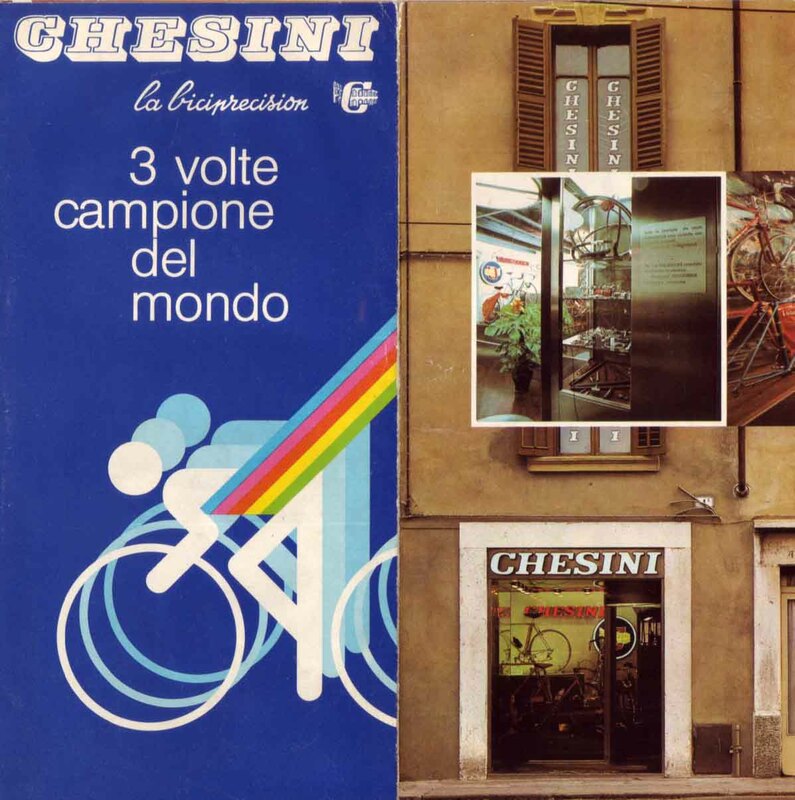 I haven´t contacted Chesini yet to ask if it´s OK to post the scans here, and if it isn´t, I´ll take them down forthwith. So here he was, our new son, roughly 17 years ago, along came a generous allowance from the city council. And what did we do with it? We bought another bl…. 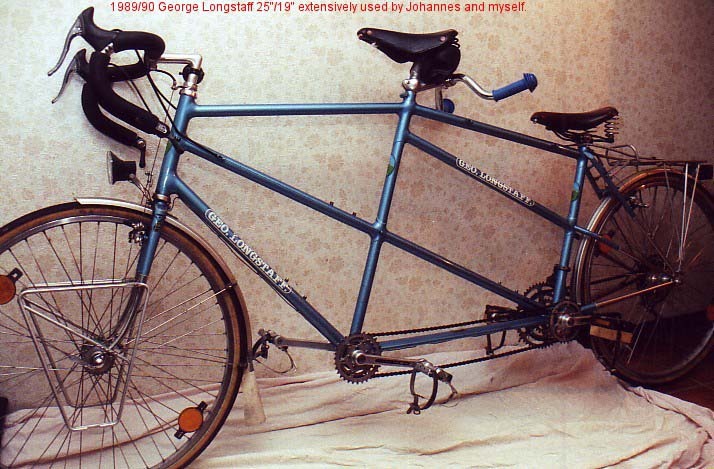 bike, even a tandem. 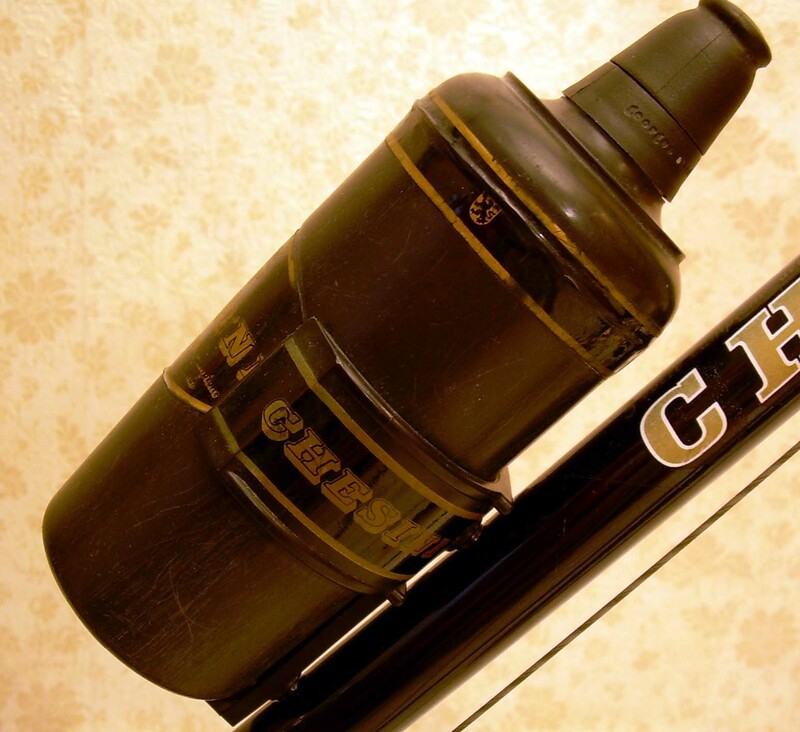 There was this ad in the Tandem Club Journal that someone living quite close to a port in the UK sold a Longstaff, just our frame sizes, 65 and 52 cm captain and stoker. I realized that my wife and I had seen this very bike and gloated over it at the 1993 (was it?) Belgium Tandem International, and here it was for sale. The original owners had sold it to someone else, and these people now wanted to get rid of it in their turn. So off I went in the car I had then, a Series I Citroen CX Ambulance Normalisée, parked it somewhere adventurous in Rotterdam and bought a foot passenger ticket. Upon arriving in Britain I was picked up by a gent in an old car who took me to his home. I think it was his daughter who had emigrated to a far flung place and left the Longstaff. I assumed I could have a quick glance at it in the garage, but no, it had been hauled up to the attic, whence it had to be taken down again laboriously. 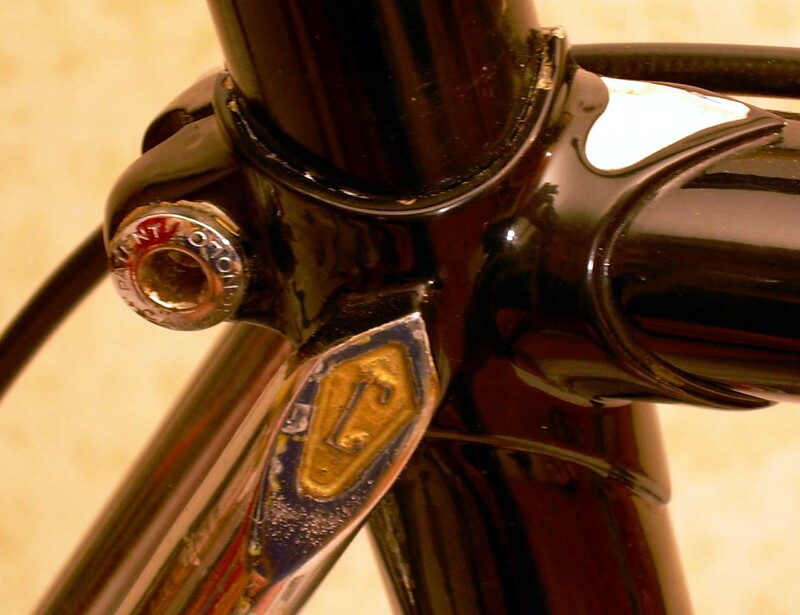 I was as smitten as I had been in Belgium, even though the new owners had managed to mechanically run the poor thing into the ground in the year they´d had it (chains, chainwheels, brake pads…), but after reassembling and paying I could ride off – or so I thought. There was a custom made car roof rack for the bike, and the whole thing would of course not fit on my hosts´s vehicle, so I had to cycle back to the ferry port with a car roof rack in one hand and my life in the other. 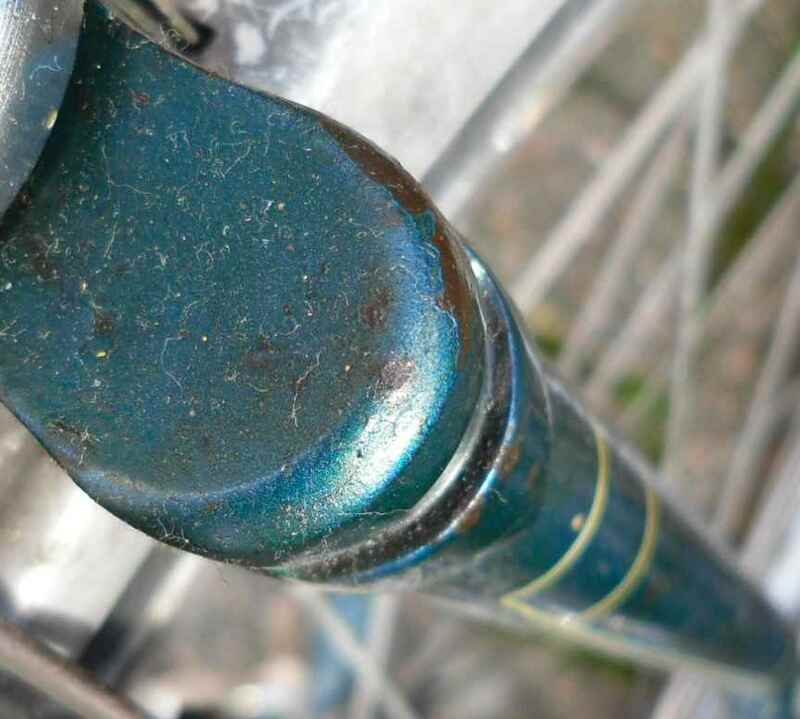 Back in Germany we put the tandem to very good use; my son learned touring on it, and when he was four we got kiddy cranks and crank shorteners from George Longstaff, and built rails from two upturned steel track handlebars with broomsticks between them. 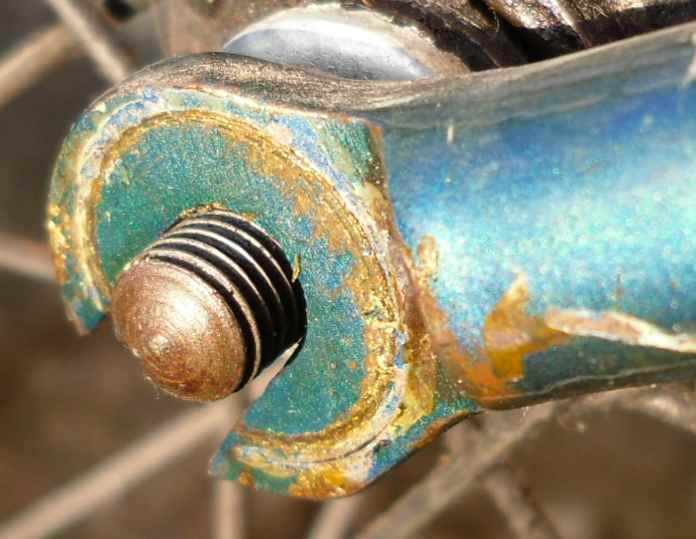 I don´t think we have a photo of this, but I remember that my son did a 75 km ride when he was just about four years old, and no extra free wheel for him hidden in the kiddy cranks, either. 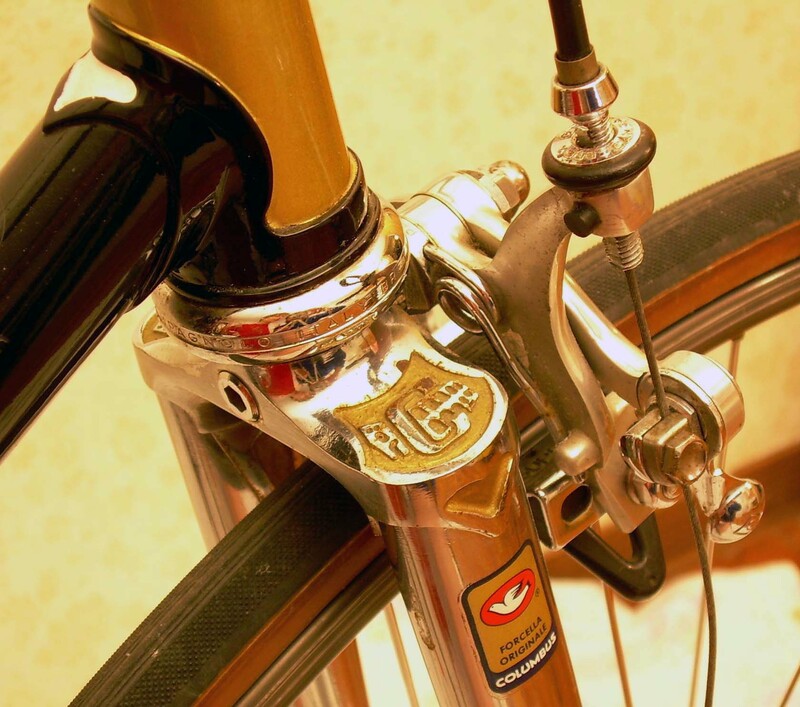 The photo in this post shows the last stage of kiddy equipment: Low saddle, more or less upright bars, but still the crank shorteners. 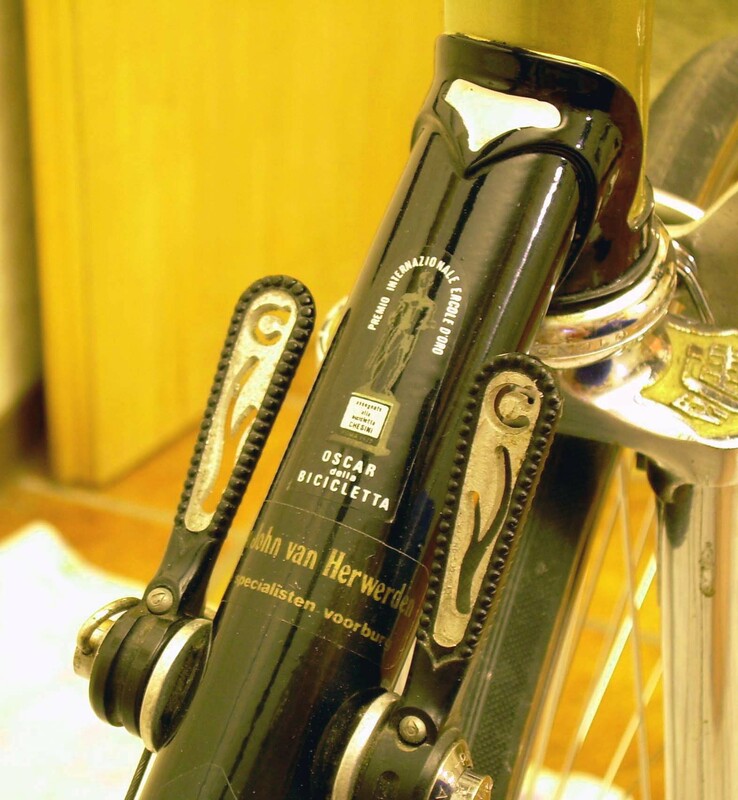 We keep thinking that we should get the tandem back into use as for five years now my son has preferred his solo, and I promise myself every spring to haul the old girl out of the cellar, but it hasn´t come to this yet. Well, it´s March right now, and who knows.